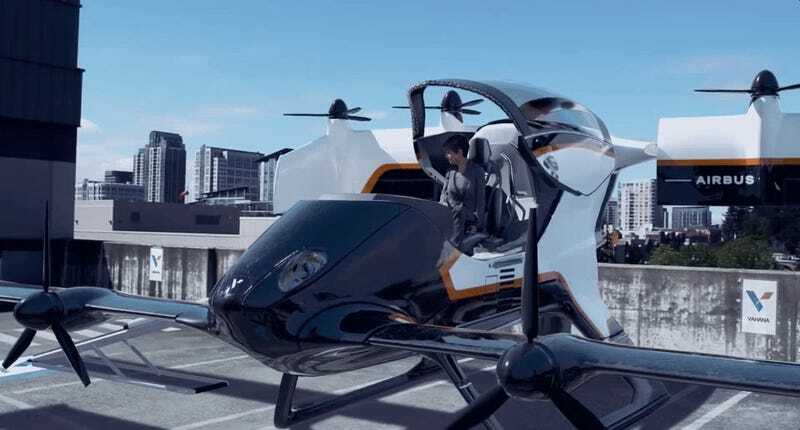 Airbus has made it abundantly clear that it would like to build a flying car-taxi-helicopter vehicle, despite the exceedingly slim possibility of one ever being used by the masses. This week, ahead of the Paris Air Show, Airbus subsidiary A3 released a video to demonstrate how this dream could work. Airbus has been chipping away at developing its electric autonomous VTOL (vertical take-off and landing) vehicle for about a year, with the idea being that you could catch a ride from one part of a downtown urban core to another. The Verge says it’s going to be displaying this vision at the Paris Auto Show next week. So, for what otherwise would be a 90-minute trip by car, Vahana says Deborah’s trip would be five times faster, but at an extra premium. Vahana would have to find a way to lower the cost, so it’s not just a service for the upper class. The Verge says the operator’s thinking is that could be accomplished by deploying the flying taxis as an Uber-like service. Maybe that’d work—in the fantasy land where a flying car-cab could be deployed. The regulatory hurdles, however, seem insurmountable. So, for now, enjoy this far off vision of the future below.